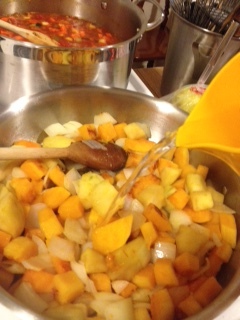 With Fall sneaking up on us I love to start stocking my freezer with some yummy fall favorites like Squash soup ! That way when my husband and I come home after a long day we can enjoy a quick easy and healthy diner with out too much fuss or muss. First like always start by prepping all of you vegetables. 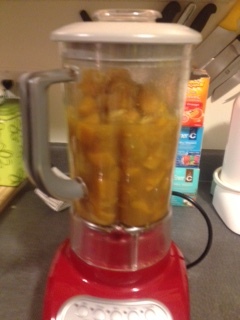 You can use a vegetable peeler to peel your squash. I tend to cut it in half before peeling so that I can have a better handle on it, so you will have the top have and the bottom. The bottom will need to be seeded which can be done with a spoon. All the vegetables can be cut whatever size you like as it will be purred in the end so you can either practice your knife skills or just cut it all into chunks. Just remember that the smaller the cuts the quicker it will all cook. I did everything in my sauté pan but you can also if you have the space and time toss all your vegetables in some coconut oil (warmed) with your spices and roast them in the oven for 20 min at 350 to get some nice flavour. OR do what I did and heat up your pan or pot (make sure it has a lid or you can use a cookie tray as a makeshift lid) put in your oil and add your vegetables. Have your pan on Med/High heat as you want to get a nice sear – stir periodically as you do not want anything to burn. Turn your element down to Med. Heat and add your spices to cook them out. Stir more regularly as spices burn faster. 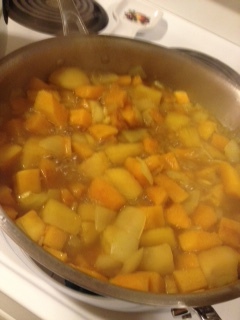 Once everything has a nice golden brown to it you can add either water or vegetable stock. You want to add just enough to cover all your vegetables by about an inch. You can add more later, this is just to cook everything down. 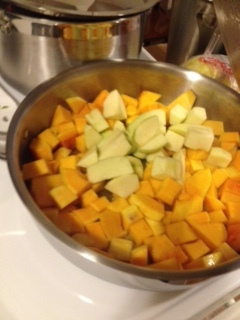 Put your lid on and let it cook until all the squash is soft. ** If you roasted your vegetables in the oven ** Take them out and put them in the pot and do the same step with the liquid and let it cook. Once everything is soft it is time to puree everything. Use whatever device you have, I used my blender. 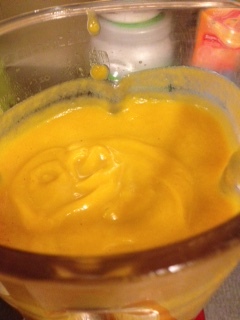 After all is pureed you can taste your soup. At this point you see if it needs more salt or seasoning, you can also add more liquid now if it is too thick and some milk or cream if you want to make it richer. What I like to call the fine tuning stage of soup making. Once you are happy with your soup you can either let it cool and freeze it for later or serve it for a meal. 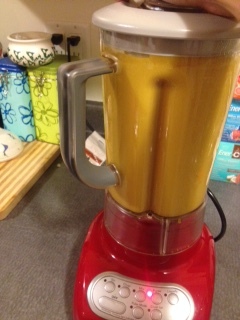 Right before serving it you can add a little bit of butter to the soup to give it more of a silky flavour. < Previous How to make Braised Red (Purple) Cabbage !